In The World Next Door, a group of plucky high school students harness the power of magic to help a visitor from another world get home. 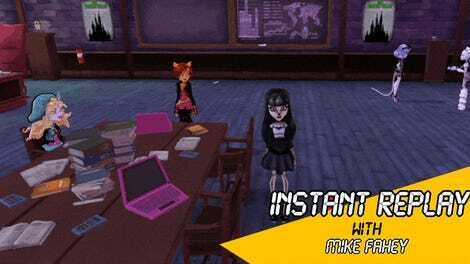 The use of magic plays out through action-packed match puzzles, and also, the students are monsters. The game as a whole is a heck of a lot of fun. Developed by Rose City Games and available now for PC and Nintendo Switch, The World Next Door is the story of Jun, a rebellious young teen who has spent her young life dreaming about visiting Emrys, a magic-fueled world that exists in a dimension parallel to Earth. The good news is Jun is chosen as one of a handful of humans to cross over into Emrys during a rare convergence. The bad news is the convergence only lasts a day, and Jun doesn’t make it back to the portal home in time. Trapped in a dimension dangerous to humans, Jun and her growing group of magic friends must find a means to re-open the portal that will return the teen to regular, boring Earth. That last part is the only problem with the premise of The World Next Door. Emrys, at least the parts Jun and her friends visit, is an amazing place, and I can’t imagine ever wanting to leave. It’s a gorgeous, colorful world, populated by lovely anime-inspired characters created by artist Lord Gris. There’s Liza, Jun’s purple-haired demonic penpal. Rainy is a timid merboy. Horace is a brash and obnoxious skull with teeth and horns. Cerisse is an alicorn, which is a hybrid of pegasus and unicorn. It’s like a grown-up Monster High. It’s part magical adventure, part teen drama, with compelling characters who grow and change as the story progresses. Rainy the merboy starts to assert himself a little more and eventually stands up to the teasing of Horace, who turns out to be more sensitive than he looks. New characters join the group, adding layers to the narrative and complexity to existing relationships. It’s a good group of kids. Jun and her spoopy friends learn that the key to opening the portal back to Earth involves traveling to Emrys’ off-limits magical temples. Defeating each temple’s guards and guardian involves matching runes and casting spells, two of my favorite things. Jun freely roams grid-based battlegrounds, looking for matching runes. If three or more of the same type of rune are connected, she can activate a spell that damages her foes. Fire runes cast fireballs. Lighting runes transform the spaces they’re on into electrical traps that shock pursuing enemies. The purple runes on the board generate a slow-moving projectile, so they work best in concert with the lighting runes, slowing down enemies for a big hit. Should the bad guys get the better of Jun, green runes are what she can use to heal her hit points. Jun is not strictly at the mercy of chance. She possesses the power to pick up runes and swap them into new spots. Using this power, she can create massive fireballs, string together spells, or pull off some clutch healing when in a jam. Jun can also call on her friends by creating special shapes with white gems. Each friend sports their own unique special ability, but not everyone can come with Jun into a temple, so players must choose Jun’s friends wisely. I wasn’t sure The World Next Door’s disparate elements would work well together. Turns out it’s a perfect combination. It’s a visual novel with puzzle battles. 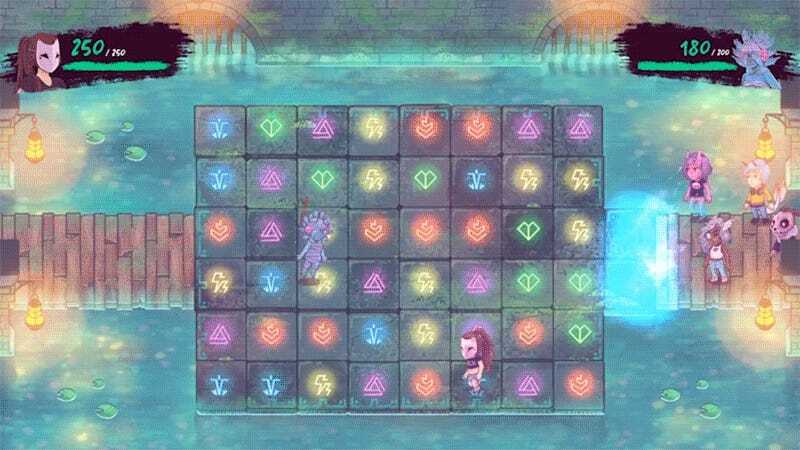 It’s a frantic puzzle game with a strong narrative. It’s the best of two things I enjoy a lot, with wonderful art and music. It’s an excellent challenge for arcade puzzle fans, and there’s even an option to turn off damage for players who just want to enjoy the story stress-free. The World Next Door is the first game published by manga and anime distributor Viz Media. I’d say they’re off to a good start. More like this, please.